Upon arrival at Quito airport, you will be met by your guide, he will transfer to your hotel. Situated in a circle of Andean peaks, Quito is the world’s second highest capital, with arguably one of the finest settings in the world. Originally settled by the Quitu tribe in the first millennium, Quito was an important part of the Inca Empire, before being destroyed and re-founded by Spanish conquistador Sebastián de Benalcázar in 1534. The colonial center – declared a World Heritage Site by UNESCO in 1978 – is one of the largest and best preserved in Latin America. It is home to excellent museums, churches and art galleries. Accommodation: Wyndham Hotel or similar. Early in the morning your guide will transfer you to Quito airport on time to catch the Galapagos flight. Before taking the flight you must pay 20 USD at the Galapagos Government Council counter that is the value for the migration control card. 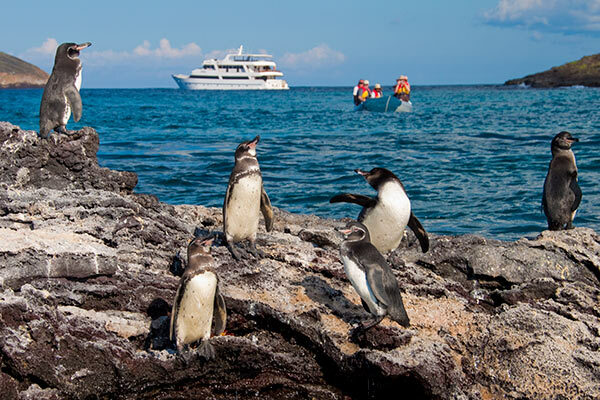 Afterwards you will be able to take a flight from Quito to Guayaquil, and then, to Galapagos. Once in Baltra passengers must go through an inspection point at the airport to make sure that no foreign plants or animals are introduced to the archipelago. Also, this inspection point is where passengers have to pay for the entrance to the Galapagos National Park under the following parameters: Adult passengers $100, Children under 12 years old $50. This little cove is located at the northern side of Santa Cruz Island, this is a red mangrove lagoon very calm and quiet which made an ideal place as nursery for many sharks and rays. Its crystal waters permit to observe large groups of white-tip reef, black tipped reef and hammer heads sharks, schools of golden rays and spotted eagle rays. There are no landing sites so the visit is done by panga or kayak. Sea turtles are frequently seen and sometimes they are seen mating in the mangrove-lined waters. Pelicans and Herons are also seen in this area. This bay has origin when the crater of this island collapsed below sea level. The wet landing is on a beautiful white coral sandy beach. This is a favorite island for birdwatchers: red footed-booby, masked boobies, wandering tattlers, lava gulls, whimbrels Yellow-crowned, black-crowned and lava herons, with and yellow warblers can be seen in the area. Continuing on the trail, visitors climb gradually to the edge of the cliff seeing Red-Foots nesting in the Mangrove trees below. Bird watching includes sightings of Sharp-Beaked Finches, Large Cactus and Ground Finches, Galapagos Doves and Swallow-Tailed Gulls. Reaching the end, the trail at the cliff’s edge offers an incredible view of the island and the many birds living there. and Red-Footed boobies in the tree; Storm petrels and Short-eared Owls have found in Genovesa lava flows the ideal place for nesting. The trail to the highlands leaves from Bellavista and passes through the agricultural zone, near the National Park boundary, the Miconia Zone, and then goes to the Fern and Sedge zone. With clear weather (unpredictable) this area affords beautiful scenes of rolling hills and extinct volcanic cones covered with grass and lush greenery all year round. Then transfer back to Baltra for embarkation on flight back home. After arrival at Quito airport, your guide will meet you and transfer to your hotel. This morning you will leave Quito with your tour guide, heading to Otavalo, the town famous for its artisans market. On route on the Panamerican Highway we will stop at Calderon, a town where the masapan figures are made, continuing through Guayllabamba town where you can try its typical fruit: chirimoya. We will also stop on the highway to admire the beautiful landscape and snow-capped mountains in the area. We continue on, making a short stop at San Pablo Lake before arriving in Otavalo. Here we will visit the textile market located at the “Plaza of Ponchos”; this is one of the most famous markets in South America. You will find all kinds of handcrafts including tapestries made on the Spanish weaving loom as well as the indigenous backstrap loom. After which you will enjoy some free time for bargaining and buying with the friendly Otavaleños. We will continue our navigation downstream to the Pañayacu River delta; take a canoe trip up the river to experience the sights of this fascinating reserve. We will seek out Pink River Dolphins, Common Squirrel Monkeys and much more. Pañacocha (Piranha Lake, in Quechua) is an ecosystem flooded by white waters. The rivers and lakes here are the perfect habitat for the infamous Piranha, as well as the Water Monkey Fish (Arawana) and White Caiman. After a refreshing swim (for the courageous! ), we will enjoy a delicious Amazon-style BBQ meal and refreshing beverages at a nearby camping site. In the afternoon, we will head out on exploration trails, and return onboard for dinner. NOTE: The detailed itinerary above is a standard model of our operation. We intend to offer everything as planned, but it is important to note depending on technical or operational difficulties beyond our control, the M/V Anakonda Amazon Cruise reserves the right to modify the itinerary without notice. After arrival at Quito airport, your guide will meet you and transfer to your hotel. Unfortunately is time to go home. The tour guide will take you to the airport.